These 3 holiday homes containing a total of 27 apartments, are located just 800 metres from the Tyrrhenian Sea and the beach, and 3.5 km from Scarlino. The houses are painted in warm colours such as orange, pale pink and yellow. Each apartment has its own terrace with garden furniture. There is a shared swimming pool for guests, complete with sun loungers and sun umbrellas. 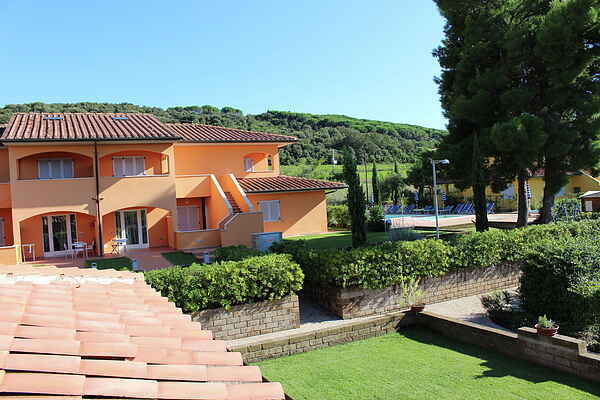 From the holiday house you can head to the beach or go on cultural excursions throughout Tuscany. You will find a golf course, tennis court and sailing school nearby. Cala Violina and Cala Martina, the most beautiful beaches in Tuscany, are just 8 km away. The beaches of Castiglione della Pescaia are also close by, just a 15-minute drive. Discover Tuscany's natural beauty and visit the nature park of dell'Uccellina, Monte Argentario, or the towns of Pitigliano, Sorano, Sovana and Scarlino. Scarlino is a picturesque medieval village on a hill, with a charming ambience and a fantastic view.